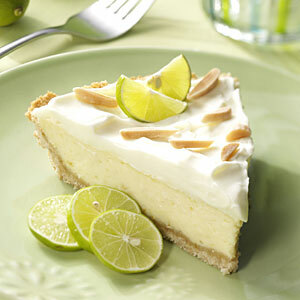 Nothing is quite as refreshing as a cool slice of lemon icebox or key lime pie after a hot summer’s day outside. Both pies fall under one recipe because, except for a couple of ingredient changes, they are the same pie. So the next time you’re invited to someone’s house for dinner, be a good guest and bring one of these easy, foolproof pies for dessert! Separate the eggs, 3 yolks in one bowl, the 3 whites in a second bowl. To the yolks, add the Eagle Brand and lemon juice and mix well. Beat the egg whites until frothy; add the cream of tarter and sugar and beat on high until stiff peaks form. Pour egg yolk mixture into graham cracker crust. Top with the beaten egg whites. Bake at 325F for 15-20 minutes. Meringue should be golden brown but if it starts to get too brown before 15 minutes are up, lightly cover top with aluminum foil. Remove from the oven and top with lemon zest if desired. Put on the bottom shelf in the refrigerator and chill for at least 2 hours before cutting. The longer it chills the better it sets. To make a key lime pie, follow recipe as written above but substitute authentic key lime juice for the lemon juice and zest from a lime for the garnish. 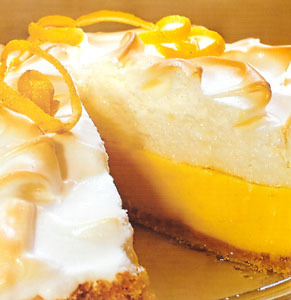 This entry was posted in Dessert and tagged key lime pie, lemon ice box pie, lemon icebox pie, lemon meringue pie, lemon pie, meringue pie by quarlj01. Bookmark the permalink.